You are here: Home / blog / Open House Today! Stop by to visit on Thursday, November 15 from 3:00 to 7:00 pm for our Open House. 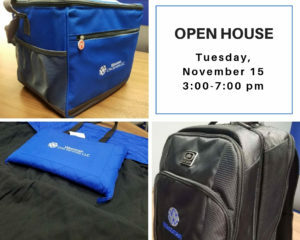 You will be able to see the new office and enter for a chance to win some Starbucks and Amazon gift cards as well as a travel backpack, cooler, and blanket in a bag. In addition, we will have snacks and smaller items to give away during your visit.